Want to find out what’s hot about dogs? Check out this article by Honolulu Weekly on Hank’s Haute Dogs. Confused and scared of the maze-like Chinatown Cultural Plaza? That might be a good thing if you get lost and find yourself at Terry’s Place, a great hidden bar. Read about it here. Out on Waianae side? Do you want something progressive and organic? Then check out Kahumana Cafe as reviewed by the Star-Advertiser here. Definitely, looks like good eats and is helping keep us keep green on the insides and out. continuining with the eating local theme for this week’s Kanu Challenge, Jo McGarry comments about her experience. In similar vein, Michael Levine of Civil Beat tracks his journey of eating local for the week here. finally, this article details how Pizza Paradiso over at Honokowai Marketplace has added a Mediterranean Grill serving up lamb gyros on flat bread, hummus, dolmas and occasionally, kebabs. 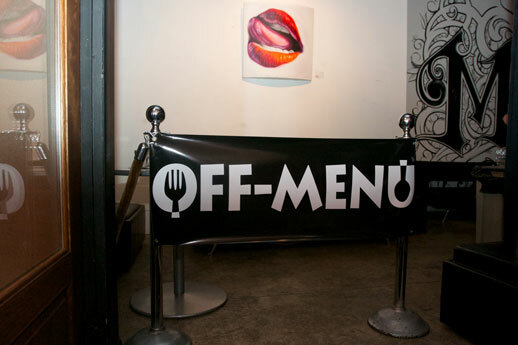 Last, but certainly not least, Refridgeraider does a write-up about Off-Menu’s Off-Premise Dinner held at Manifest this past Monday (9/27), check it out here. As always if you’d like to follow the Grub Club feel free to subscribe by clicking the appropriate option on the sidebar. If you are interested in joining us for a dinner, event, or just to find out what the club is up to send us an e-mail at Hnlgrubclub@gmail.com.